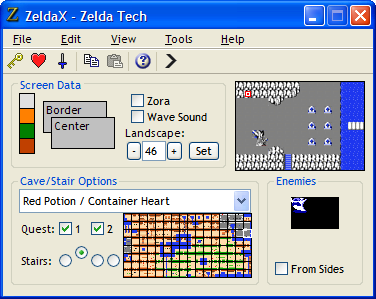 Zelda Tech is an overworld editor for the Legend of Zelda. In addition to basic screen editing it includes a shop editor, a string editor, mapping utilities (including cave maps), provisions to create a functional second quest, and much more. This version requires Microsoft’s .NET Framework 2.0 or higher. This combined with dungeon editor, I have been able to create my 3rd quest of Zelda. Thank you.